Holiday home De Weide is a Summer home in the artist village of Bergen. The cozy atmosphere is reminiscent of living on a \"house boat\". In no time you are in the beautiful village where lots of artists enjoy the mystical light and the vistas. 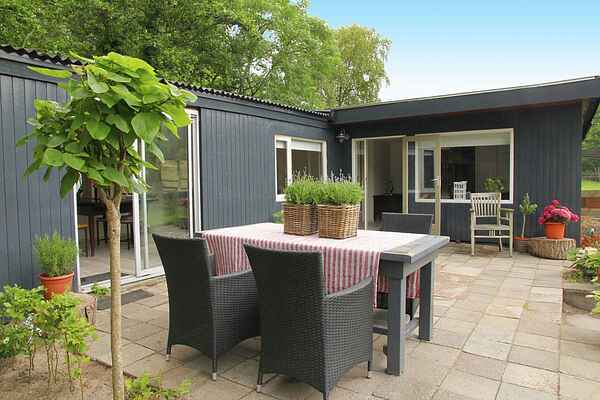 You could call De Weide cozy in a North-Holland kind of way, you feel the rushing of the sea. Floorboards are creaking under your feet and there's a table made out of distressed wood. You can go hide in the box bed with its' cute shutters, you can even light some candles to place on the planks above the bed. A romantic feeling of yesteryear! You can follow a route full of art history from Bergen, passing by the old house of the poet Adriaan Roland Holst where you then can go write a wonderful poem to your loved one in the glimmer of the moon. You'll put spades, buckets and drinks in the car and be in Bergen aan Zee in no time. Bergen is also a great base to go and explore larger cities in Nort-Holland and Frisia. The dunes, the forest, the beach and the sea are all at your feet in Bergen.